Pulling out all stops to give the forthcoming weekend a different vibe and visibility, JKK will be showcasing two unique theatre productions. 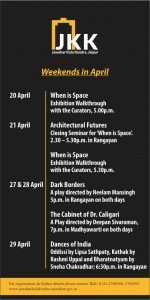 On 27 and 28 April there will be a showing of plays ‘Dark Borders’ by Neelam Mansingh and ‘The Cabinet of Dr. Calgari’ by Deepan Sivaraman. On 29 April – ‘Dances of India’ will be presented by Lipsa Sathpathy, Rashmi Uppal and Sneha Chakradhar. The theatre production “Dark Borders” will bring to life the stories of renowned playwright, Saadat Hasan Manto. The play will present improvisational pieces which will explore the devastation brought upon women and families during the time of political and social disruption. These are the lives of the forgotten people, those who exist on the margins of the society, to whom Manto gave a voice, a spirit, an identity and dignity. Manto’s work lays before the audience the consequences of hatred and violence through a display of absurdity and wry humour. Inspired by 1920 German expressionist film, renowned theatre director, Deepan Sivaraman will present the play ‘The Cabinet of Dr. Calgari’. The theatrical piece is a dark thriller set in Nazi Germany that brilliantly portrays the contemporary political setting. 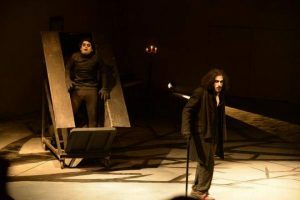 Following the story of Dr. Caligari and a sleepwalker who is put to malicious use, the play is a dark tale of murder and mayhem. 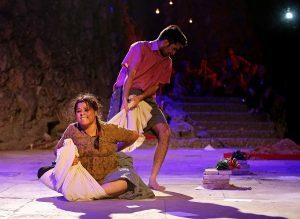 It is also a political tale which is an avant-garde experimental piece. ‘Dances of India’ will feature an Odissi dance by well-known Odiya actress and dancer, Lipsa Sathpaty. Satpathy is a star performer who uses her body language make her dance dazzle. She has the inherent gift of speaking with her eyes and choreographs abstract dances which breathe life into the footwork-oriented pieces. Similarly, Rashmi Uppal will present a Kathak piece. A versatile and powerful performer Rashmi is an impaneled artist. She has had the opportunity to participate as a soloist and in group productions, both in India and abroad. She has been trained in the classical dance form of Kathak under the able guidance of Smt. Bharti Gupta, a senior disciple of Pt. Shambhu Maharaj. 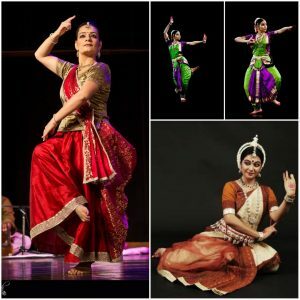 Dr. Sneha Chakradhar has been pursuing the classical dance form of Bharatanatyam since the age of nine and is blessed to have learned under the best Gurus in the field. Sneha has had the opportunity to present solo performances and be part of prominent choreographic works at some of the most prestigious cultural spaces in India and abroad. Sneha has traveled extensively with varied productions addressing issues ranging from drug abuse, HIV AIDS and violence to female feticide, women’s identity and empowerment.